Canned foods are convenient, portable, quick, and have a long shelf life. They also help provide needed nutrients to meet USDA Dietary Guidelines. During February, National Canned Food Month, experiment with different recipes and meal ideas using canned foods. There are several varieties of canned foods on grocery store shelves, offering an array of nutritious options. Check out the following tips on storing and using canned foods. Tips to remember when purchasing canned goods. Avoid rusted, dented, scratched, or bulging cans. Always check freshness dates on foods. Below are different types of “dates” you may see on canned items. Sell by: tells the store how long to display the product for sale. You should buy the product before the date expires to have enough time to use it at best quality. Best if used by: is recommended for best flavor or quality. It’s not a purchase or safety date. Use by: is the last date recommended for the use of the product while at peak quality and has been determined by the manufacturer. Closed or coded: are packing numbers for use by the manufacturer to rotate the stock as well as to locate products in the event of a recall. Compare food labels to help make healthier choices. Read the Nutrition Facts Label on products to find food with the most nutrition for your money. Using the Nutrition Facts Label helps you compare fat, calories, fiber, sodium and sugar found in different products. They also provide information on the serving size and how many servings are in an item. Look for lower sodium or no salt added versions of canned foods. Pay attention to storage location and temperature for optimal quality. Store canned food in clean, cool, dark, and dry spaces. Don’t put them above the stove, under the sink, in a damp garage or basement, or any place exposed to high or low temperature extremes. The optimal temperature range is 50-70º Fahrenheit (F). 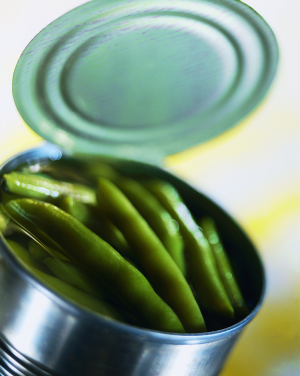 Temperatures over 100º F may cause canned food to deteriorate and lose quality. Freezing temperatures may cause changes in food textures, and lead to rust, bursting cans, and broken seals that may let in harmful bacteria. Use the first in, first out rule. To prevent foods from spoiling use the first in, first out rule as your rotation system. Using this rotation method will help you use older canned and dried food items before using recently purchased products. Write the date of purchase on food items to help maintain a rotation. Check canned items regularly for signs of spoilage. Do not use food from cracked, bulging or leaking cans, or those that spurt liquid when opened; discard cans immediately. Fortify meals with fruits and vegetables.. Canned fruits and vegetables are always in season and packed at the peak of freshness. Keep canned tomatoes, beans, fruits and vegetables on hand to quickly create meals or boost the nutrition of recipes. Try adding canned black beans, chick peas, Mandarin oranges, beets or other colorful fruits and vegetables to your next salad. Canned soup, broth, pasta and chili can serve up meals with vegetables, grains and protein. Check out these resources. Food safety tips and time saving recipe and meal ideas at: http://food.unl.edu/february-food-calendar#cannedfood. Feel free to use/adapt Healthy Bites material (with credit) for your own articles, blogs, handouts, etc. An example credit line would be: Authored by or Adapted from Lisa Franzen-Castle, PhD, RD, University of Nebraska-Lincoln Extension Nutrition Specialist. Healthy Bites Newsletter, http://food.unl.edu/healthy-bites-february-national-canned-food-month, February 2016. How to Interpret Can Sizes. Some favorite older recipes may call for can sizes such as a Number 2 or a Number 303 can. Here's a chart to help you determine how these correspond to current can measurements. Basic Foods to have on Hand. This list of foods can be combined and recombined in a variety of new, delicious (and nutritious!) ways. They are offered as a starter list to help develop a list that works for you. Recipe Central. Enjoy healthy cooking from your own kitchen. Use recipes from our collections to get started! Nebraska Extension Food-themed Calendar. National Food Days, Weeks, and Months for February. If other, how do you plan to share it?